By Srikanta Mohanty: Ghumura- the dance that combines grace in movement and rhythmic elegance in its folk form- is popular in the district of Kalahandi in Odisha. The themes greatly express elements combining religious hymns, the glory of the past, and literature from mythology and as a creative art, it enjoyed in the past noble patronage from the royal families in the state. Come Dussera and Nuakhai, the district celebrates with grand paces of Ghumura. Legend has it that this dance form is part and parcel of Odisha for thousands of years. 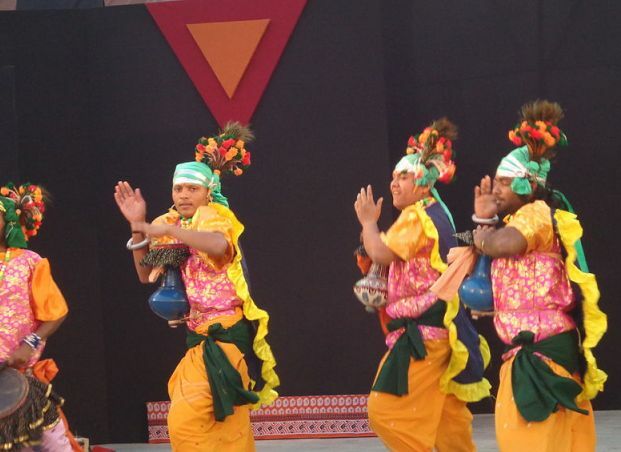 “Today, Odishi is enjoying world-class reputation because the other folk dances have richly contributed to it. Lending styles in movements to the main-stream dance of Odisha, Ghumura has its own charming moves that convey a wide reportire in expression’-Says Sangeeta Sahoo- a exponent of classical dance forms at Bhubaneswar. Tracing its earliest origin to the districts of Kalahandi and Nuapada, historians believe that it existed in the human habitations in the river valley of Indravati and from there it spread to the surrounding areas. The caves in such districts have such several paintings, which are ample evidences of growth and spread of this dance form .Even legend says, this dance is an excellent combination of Lord Shiva’s Damru and Goddess Saraswati’s Veena. The dance and music were instrumental in killing Mahisasura- the demon king-who was killed by Goddess Durga. Even the epic battle of Mahabharata, Ghumura was engaged as a musical instrument in war by the Gods and Goddesses. There goes the strong belief that during the days of war in Ramayana, Ghumura was used to produce war music. Archeologists have found evidences of this dance from the engravings in Sun Temple of Konark. This amply proves that this dance was in its rich form even during medieval times. “Even the costumes used in this dance remains inspiring and brilliant for creative ideas, although those date back to ancient period. I believe such costumes could get redesigned to become fabulous designs in fashions, especially for the dance troupes in Odisha, who have won national and international competitions in talent shows’-says Balaram Panda, who runs a dance and talent management center at Bhubaneswar.